Find of the Week! Playing Card Trays. Sometimes a room just needs a shot of fun. Something less serious, a little more playful, and of course it has to be well-designed. These decoupaged glass trays from Jayson Home and Garden are definite winners, and I’ve been eying them for quite some time. I love the graphic simplicity, the slightly antiqued finish, and the sleekness of the glass. Whether hung on a wall as a set of four or placed on a table to hold chips (of the poker or potato variety), I love love love them. 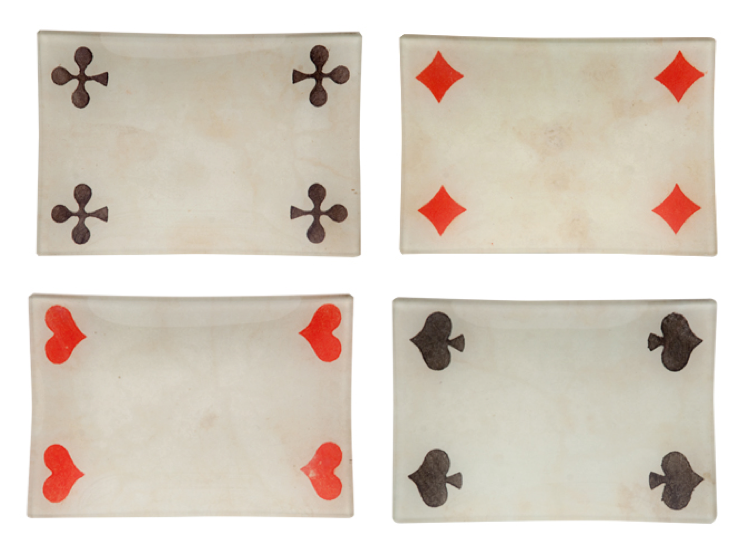 Each tray — 4 of Hearts, 4 of Spades, 4 of Clubs, and 4 of Diamonds is 4.5” x 6.5,” costs $78, and is available from Jayson Home. Categories Accessories, Find of the Week! ← Five Under $50: Throw Blankets!